Comments: Bosque® has exhibited incredible heat and drought tolerance in the extreme summers of 1998-2000. Bosque® offers the complete package -- unique upright oval habit, superb foliage, puzzle-like exfoliating bark, and landscape adaptability. 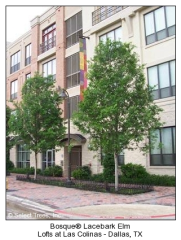 As a street tree in narrow planting areas, parking lots, large planters, or anywhere the imagination travels, Bosque® Lacebark Elm will settle into a life of contented culture.